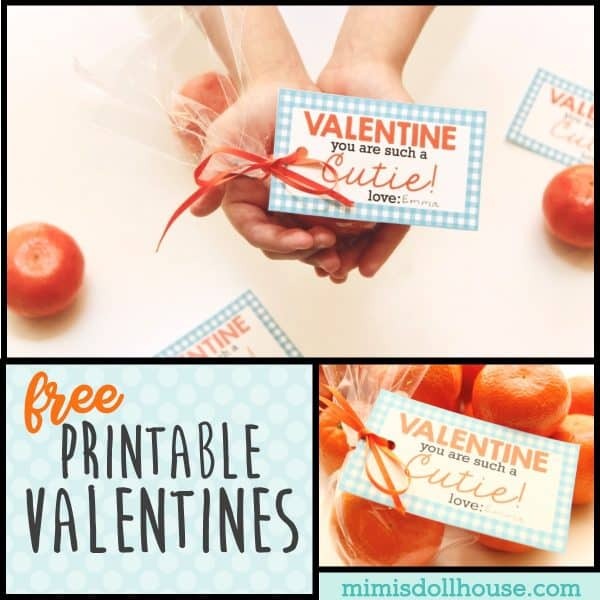 Cuties Valentines: Free Printable Valentines. Looking for a fun and healthy way to spread some love this Valentine’s Day? 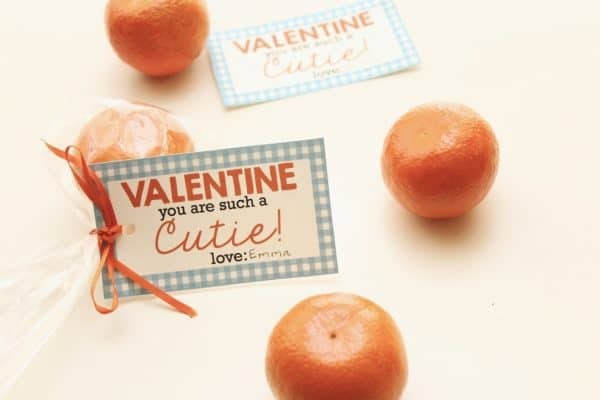 Why not download some free printable valentines and give delicious oranges this year? Looking for more Free Valentines? 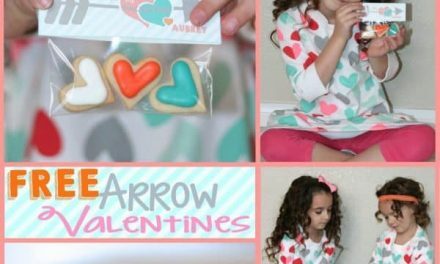 Check out these Emoji Valentines, these Arrow Valentines, these Mustache Valentines and this fun Valentine’s Day party. I love Valentine’s Day. Every year, one of my favorite activities is planning out Valentines ideas and getting the Valentine’s ready for school. This year, my 2nd grader is in a class with quite a few allergies. 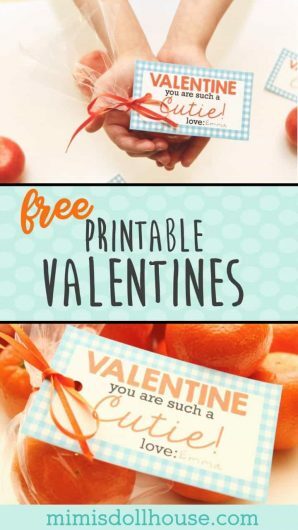 This got me thinking about ways I could make Valentines easy and make sure that all the little kiddos in her class could partake in the Valentines we sent in. There have been years where we have done toy Valentine’s instead of candy…but this year, I decided that a healthy food option sounded like the best option. 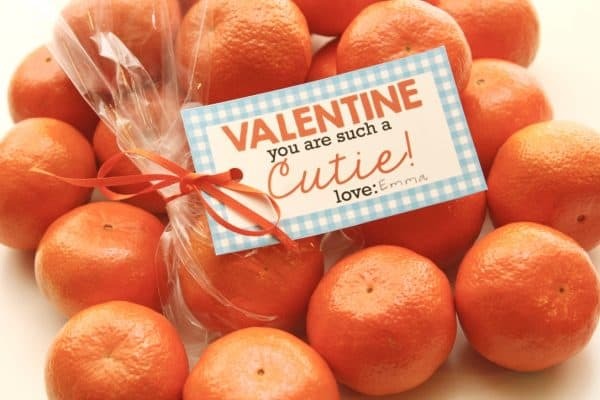 Clementines are her favorite after school snack anyway…so it was the perfect match for a Valentine treat. 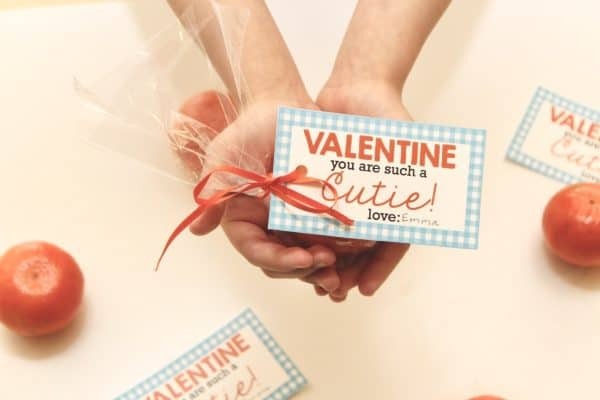 She is very excited to give out these fun printable Valentines, although since she is eight…she is nervous that the boys in her class will think she likes them! It was fun to let her help put these together. She was able to cut them out and hole punch them, place the cuties in the bags and tie the tags on all on her own!!! 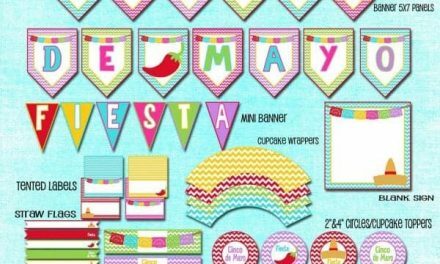 It won’t be long before she is designing the printables too! These are super simple! 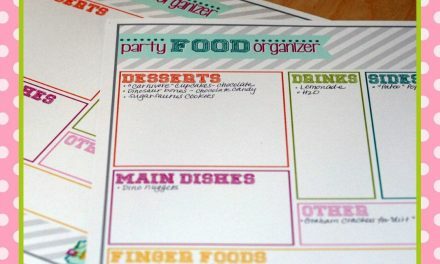 Download the printables using the link below. Print on cardstock or matte photo paper. (Need paper recommendations?) Cut the Valentines with scissors or use a paper cutter. 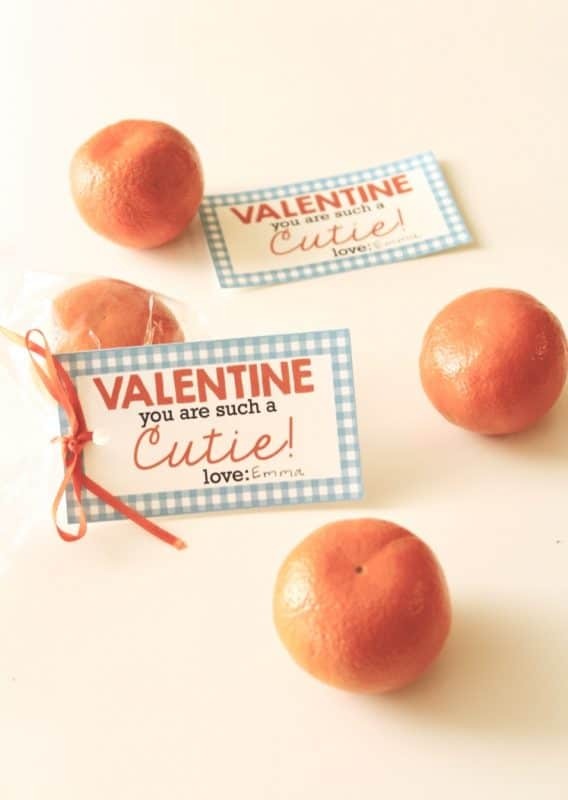 Have your kiddos sign the Valentines and attach oranges in cellophane bags with ribbon. Easy peasy and less expensive than the generic store bought valentines!!! Mom for the Valentine’s Day win!!! I love the blue and the orange together…such a fun non-traditional Valentine treat! If you desire a more traditional candy valentine, we also have Emoji Free Printable Valentine’s Day Cards, Free Arrow Printable Valentines, Free Mustache Printable Valentines, Bee Mine Printable Valentines and Free Sunglasses Printable Valentines!!! Download the Cuties Valentines here! 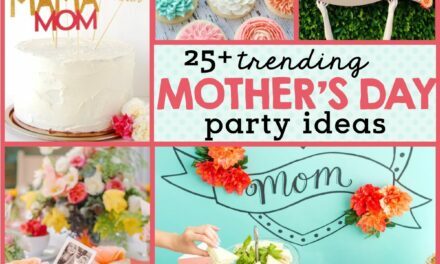 Be sure to check out our Valentines parties, Valentine party ideas, Valentine crafts, Valentine food ideas, Valentines cookies and Valentine birthday party!